I presented my abstract “Correlation of prothrombotic markers with genetic markers of hypercoagulability in ischemic stroke” under the genetics subsection at the Congress. I also took teaching courses on acute stroke treatment and uncommon causes of stroke. The lectures on translational stroke research and global stroke policies offered a good retrospective. The session on challenges in acute stroke trials also addressed some very important issues that are relevant in the implementation of any trial. Participation in the WSC presented a unique opportunity to discuss my research in stroke genetics with many delegates from different nationalities from around the world. Such conferences help us to perceive that the world community must stay united across frontiers in search of solutions to problems that we all have: implementation in acute stroke care and improving stroke awareness globally. At the cusp of the matter though, is to address the issues of timeliness of action, intervention and holistic treatment thereby paving the way toward a fuller life after stroke. It was very encouraging to listen to the results of the MR CLEAN trial (Multicenter Randomized Clinical trial of Endovascular treatment for Acute ischemic stroke in the Netherlands), which were announced on the last day of the congress, and gave new hope in the field of endovascular stroke treatment. They say that education is never complete without traveling, and so I managed to squeeze in some time into my itinerary to soak up a fair glimpse of the city of Istanbul. The Minia Turk, which was located very close to the congress venue, is a nice park displaying many historical Turkish locations in a miniature form—with cryptic details to encapsulate the significance—so as to flip through a moment in this cradle of civilization. I could traverse the memory lanes of time past: of monuments like Hagia Sofiya and the magnificent Blue Mosque. In the evenings we savored a few delicious Turkish specialties in Taksim. Overall it was an enthralling experience for me—getting an impetus at the right time in my career and providing me with a better world view of the field of stroke neurology. As inhabitants of this planet we all have a shared responsibility in the welfare of our fellow beings; as medical professionals, in true Hippocratic traditions, we have a commitment to alleviate the rigors of suffering humanity anywhere and everywhere with our combined resources, knowledge and skills. 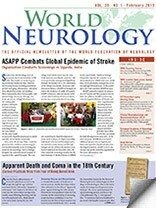 In this sense I am very grateful to the World Federation of Neurology for their initiatives, graciousness and support.